Posted by	meadtree.com	& filed under	Tree Care. During the winter months, most people are content to be indoors, and don’t give much thought to their yards or trees. However, you might consider inspecting your trees once the leaves have fallen. 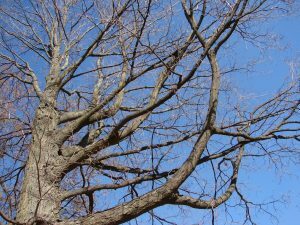 There are many reasons that winter is an excellent time to prune deciduous trees. The exposed branches make it much easier for an arborist to identify and correct structural problems, and to remove dead or diseased limbs. Tree Pruning in winter is also more environmentally friendly, creating less waste and less damage to yards due to the frozen ground. Mature trees can be pruned in winter to make them more structurally sound and less prone to future storm damage. Poor branching structure increases the chances of failure during heavy snow fall, ice storms, or windy days. Dead, broken, or diseased branches should also be removed. If removal of a particular limb will destroy the shape of the tree, support cabling can be installed to improve the stability of the limb. Tree pruning in winter also prepares the tree for a good start up in the spring, as energy stores will not be wasted on unhealthy material. In addition, cut wounds have the opportunity to compartmentalize without the risk of attracting sap-loving insects. Corrective tree pruning can also be accomplished more easily in the winter. This can include removing branches that aren’t growing as we’d like, interfere with other branches, rub against a building, or overhang a walkway or roof. The result will be a healthier and safer plant. Young trees should be pruned to provide good structure for future growth. Structure pruning establishes a dominant central stem (reducing or eliminating co-dominance) and branch spacing, reduces stress on weak tight V crotches, removes or reduces rubbing and crossing limbs and dead or diseased limbs. This will result in improved tree health and reduce the overall cost of maintenance pruning throughout the life of the tree. Reducing co-dominant stems may change the aesthetics of an individual tree short term, but this will allow the dominant stem to fill in where the reduction was made. Structural pruning done on small trees during the spring and summer creates holes in the canopy that can be unsightly. However, winter tree pruning gives the tree a chance to fill in holes during spring leaf out. This makes the tree look more balanced and gives it a fuller canopy earlier in the season. Young trees are full of vigor and respond well to structure pruning. Generally pruning cuts in young trees are small, allowing for complete wound closer much faster than larger pruning cuts in mature trees. Structure pruning is best achieved in stages beginning within 1 to 2 years of planting, once the root system has established itself and then in 2 to 3 years and again in 3 to 4 years. Once good structure has been achieved and trees reach maturity, the pruning cycle is about 6 to 10 years. When trees are dormant during the winter months, it is an ideal time to inspect and correct young tree structure through pruning.